It is unclear where US 13's south end was initially, although I surmise it was the ferry landing to Norfolk. The first map I have to sorta definitively show it is the 1935 Northampton County map which shows the south end looking to be at the west end of Mason Ave. Adjustments: In April 1928 (CTB), VA 34 (and therefore US 13) was officially designated to follow today's US 13/13 Bus from Sunnyside to Exmore instead of the original routing using today's SR 618, SR 622 to Bridgertown, SR 619, then SR 618 to Franktown and Exmore. In 1930, VA 34 was rerouted to avoid Belle Haven by replacing VA 526 from Exmore to Belle Haven Station. The old route via Belle Haven became parts of VA 522 and a second VA 526 (now VA 178 and VA 181). In July 1933, VA 34 was dropped from US 13. 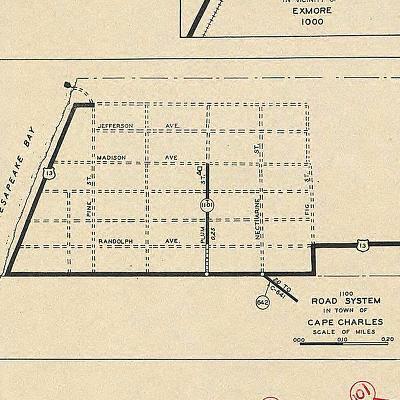 In Sept 1934 (CTB), US 13 was extended north along Bayview Ave in Cape Charles, then curled around to end at the dock. unfortunately, 1936 was the first year the county map had a Cape Charles inset. Around 1943, US 13 was continued across the Cape Charles ferry to Little Creek, then replaced VA 13 down Diamond Springs Road, Waterworks Rd, Princess Anne Rd, and Military Hwy around the Tidewater area to end at US 58 (now VA 191) Bowers Hill. VA 13 in Tidewater area. In Sept 1945, the Interregional System of Highways was distributed to the CTB. They approved all the routes therein for Virginia (except wanted to change US 211 as a corridor to VA 55), plus added 2 more corridors. One was US 13 from Cape Charles to Maryland, "provided the Public Roads approves the addition within Delaware and Maryland." The next mention of the Interregional System of Highways occurs in the April 1958 CTB, which summarizes what happened in 1945 and notes that the Bureau of Public Roads only accepted one of the 2 additional corridors, US 301 from NC to Petersburg. Sometime in 1950 (per April 1951 CTB), US 13 was rerouted from Cape Charles to the Kiptopeke Ferry location. Some of this was a replacement of VA 186. 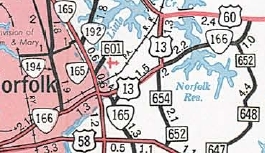 The road to Cape Charles became US 13 ALT (now VA 184). See scan under US 13 ALT entry. In Oct 1950 (CTB), US 13 was removed from Waterworks Rd and Princess Anne Rd, leaving behind VA 165Y (east of I-64 is physically gone) and VA 165. US 13 was instead placed on Northampton Blvd in this area. 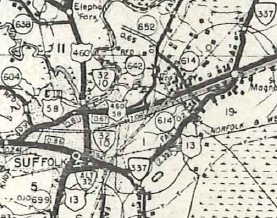 About 1952, US 13 was extended along US 58-460 to Magnolia, VA 337 into central Suffolk, then after a brief VA 32 duplex south, replaced VA 37 through Whaleyville and into North Carolina. In Oct 1957 (CTB), US 13 was placed on Hall Ave between Saratoga Ave and Washington St in Suffolk, leaving behind VA 337. 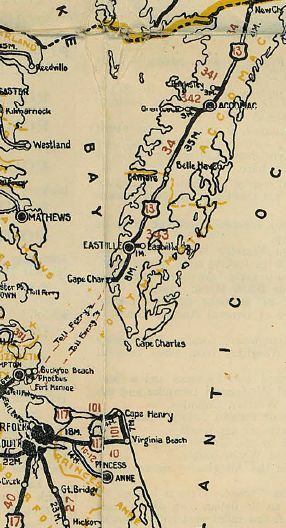 In May 1960, the CTB requested an interstate corridor on the Eastern Shore. it is unclear what happened to this other than it didn't happen. 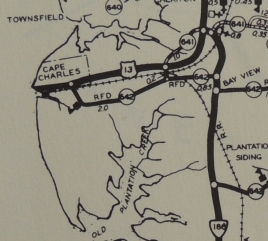 In Feb 1964 (CTB), US 13 was moved from Diamond Springs Rd to Northampton Blvd and over the new Chesapeake Bay Bridge-Tunnel as a route swap with VA 166. In Northampton County, US 13 was removed from Kiptopeke, leaving behind SR 704 which is still 4-lane concrete. In Oct 1966 (CTB), US 13 received bypasses of Cheriton/Bayview, Eastville, Exmore, and Onley/Tasley/Accomac C.H. All old routings became US 13 Business segments. See scans in the US 13 Business listings. In Aug 1970 (CTB), US 13 was placed on I-64 from Bowers Hill to Northampton Blvd, leaving behind US 13 Business. In June 1974 (CTB), US 13 was removed from Hall Ave and VA 337 and instead began using today's US 13 Business through Suffolk. Oddly, officials from 1975-80 show US 13 on its old routing, when they never showed it when it was actually happening. Around 1980, US 13 was returned to Military Hwy and Northampton Blvd, replacing US 13 Business. See scans in the US 13 Business listings. On March 19, 2003, US 13 was rerouted to go around the west side of Suffolk as new constructed freeway, although posting of the original Suffolk Bypass with US 13 shields took a couple months longer. See scans in the US 13 Business listings. 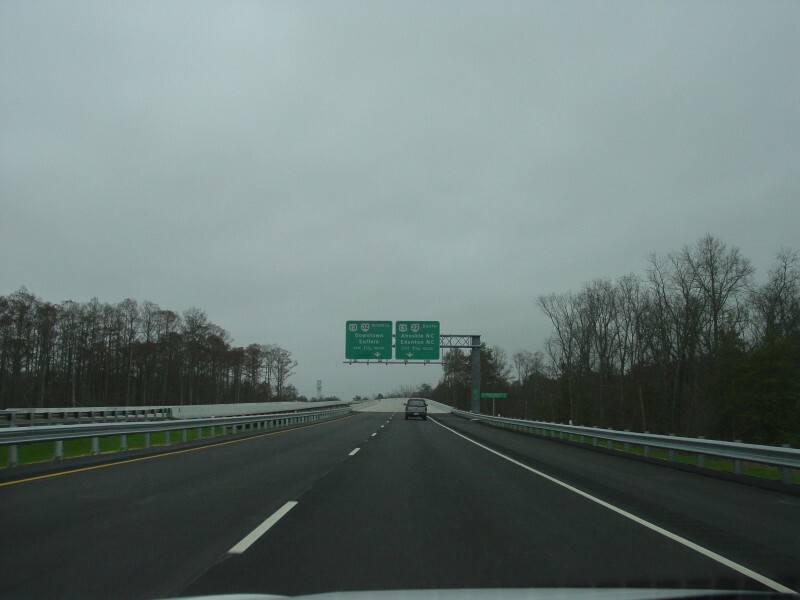 In 2006, the General Assembly directed DOT to study the idea of an I-99 to run up the Eastern Shore. Go to the I-99 page for details. Improvements: Upon designation in 1926, US 13 was paved from Cape Charles to Sunny Side; Keller to Rue; Oak Hall to Maryland. The First segment of US 13 to be multilaned was when it was added to Military Hwy around 1943. In 1949, US 13 was multilaned from Accomac C.H. to VA 176 and from VA 175 to Maryland. In 1951, US 13 was multilaned on its Northampton Blvd and diamond Springs Rd routings; also from Temperanceville to Oak Hall. In 1952, US 13 was multilaned when it was added to US 58-460 from Bowers Hill to Magnolia. 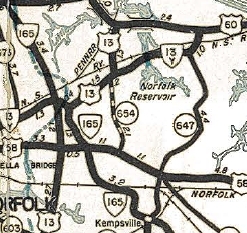 In 1953, US 13 was multilaned from VA 176 to Mappsville. In 1959, US 13 was multilaned from SR 683 to SR 684. 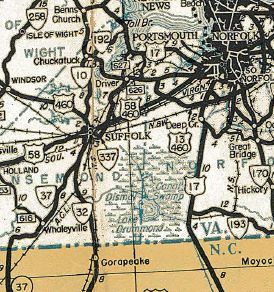 In 1964, US 13 was multialned from old US 13 (now SR 704) south to the Chesapeake Bay Bridge-Tunnel; also US 13 was multilaned when moved to its all-Northampton Blvd routing. The 1965 and 1966 Officials show US 13 widened from SR 684 to north of Eastville, although no bypasses are shown. This may be a premature showing on the map or US 13 was widened between bypass segments. In 1974, US 13 was 4-laned from Magnolia to Suffolk when it was removed from VA 337 and Hall Avenue. In 1976, US 13 was widened from Suffolk south to the VA 32 split. In 1999, US 13 was multilaned on the bridge segments of the Chesapeake bay Bridge-Tunnel. In 2003, US 13 was multilaned around Suffolk when rerouted onto its Suffolk Bypass (full freeway). US 13 is 8-lanes from Diamond Springs Rd to I-64; Lowery Rd to US 58; I-264 to Indian River Rd. US 13 is 10-lanes from US 58 to I-264. Posted: Fully posted; mainline US 13 cutouts on the Eastern Shore gradually disappeared during the 2000s, the last known cutout at SR 642 below Cheriton still remained in April 2007 but was gone by 2013. A series of "TO US 13" trailblazers exists on westbound VA 166 in Norfolk, including one just west of the US 13/VA 165/VA 166 intersection. Other names: Whaleyville Blvd/Carolina Rd (S Suffolk); Military hwy (E Suffolk/Chesapeake/Norfolk); Northampton Blvd (Norfolk/Va Beach). Comments: US 13 now (since mid-2004) has mile markers from the north end of the Chesapeake Bay Bridge-Tunnel (MM 70) to the Maryland State Line (MM 138). Westbound along VA 166/Princess Anne Rd has TO US 13 trailblazers. This may not seem like much, except that it's moving away from US 13 at the Princess Anne Rd/Northampton Blvd/Military Hwy intersection (where US 13 meets with VA 166). Turns out they direct you to turn left on Azalea Garden Rd to reach US 58 where one can jog east back to US 13. I guess people didn't notice Military Hwy when coming down Northampton Blvd. Froggie has a photo journey of the Suffolk Bypass of US 13 - here. The main drag of the Delmarva Peninsula, which I became familiar with as a child on my family's biannual trips to my great aunt's home in Jarvisburg, NC. Highlights include: one of my favorite town names - Mappsville, Owl Restaurant in Accomac, and, of course, the famous Bridge-Tunnel. Mike would like to add Formy's Restaurant (BBQ) in Painter. Froggie's usual stop is at the Great Machipongo Clam Shack just north of Nassawaddox, well-known for fried seafood and soft-shell crab. Creation: Appeared Oct 1966 (CTB) when US 13 was placed on a new bypass around the west side of Bayview and Cheriton. This is the 1st US 13 Business. Posted: Fully posted; cutouts were still present at SR 641 in April 2007. Comment: Bayside and Cheriton are extremely small towns. Creation: Appeared Oct 1966 (CTB) when US 13 was placed on a new bypass around the east side of Eastville. This is the 2nd US 13 Business. Posted: Fully posted; cutouts were still present at SRs 634 and 631 in April 2007. Comment: Eastville is also pretty small but is the county seat of Northampton County. Creation: Appeared Oct 1966 (CTB) when US 13 was placed on a new bypass around the west side of Exmore. This is the 3rd US 13 Business. Posted: Fully posted, except at its northern end (US 13 Bus is posted to turn away from VA 178). Comment: Exmore is larger than Eastville or Cheriton. Creation: Appeared Oct 1966 (CTB) when US 13 was placed on a new bypass around Onley, Tasley, and Accomac C.H. This is the 4th US 13 Business. Improvements: Paved upon inception; Multilane segments from Accomac C.H. northward since inception. Scenic Byway: SR 605 to VA 126 (since 2/16/94). Comment: Accomac CH dropped the 'K' from its name many decades ago but the county keeps that original spelling alive. Creation: Appeared March 2003 when US 13 was placed on a bypass around the north and southwest side of central Suffolk. This is the 6th US 13 Business. Comment: US 13 Business has no solo segments to call its own. Some Rand McN issues have shown VA 337 as US 13 Business from Sufflok to Magnolia. US 13 Business #5: Appeared Aug 1970 (CTB), as a renumbering of mainline US 13 through Chesapeake and Norfolk. US 13 Business followed Military Hwy from I-64/US 13 Bowers Hill to Northampton Blvd, then east over to I-64/US 13. Around 1981, US 13 Business returned to being mainline US 13. When I lived in Norfolk in 1991-93 there were still a few US 13 Business postings on the route. US 13 ALT #1: Appeared in 1950 as a renumbering of mainline US 13 from Eastville to Cape Charles. After US 13 was routed to catch the ferry to Norfolk further south, there was still a ferry from Cape Charles to Old Point Comfort (Hampton). This ferry was gone by 1956, though US 13 ALT was still there. US 13 ALT was renumbered as VA 184 in May 1957 (CTB). US 13 ALT #2: Appears in March 1958 CTB Minutes as a proposal by City of Hampton and endorsed by a member of the CTB to establish this to run from Old Point Comfort (via Ferry from Kiptopeke - there were 2 ferries from Kiptopeke then) over US 258 to Benns Church, then down VA 10 to meet US 13 again in Suffolk. Further study determined that this designation was unwise due to a second toll at James River Bridge and the route would be mostly 2-lane. US 13 ALT to Cape Charles.